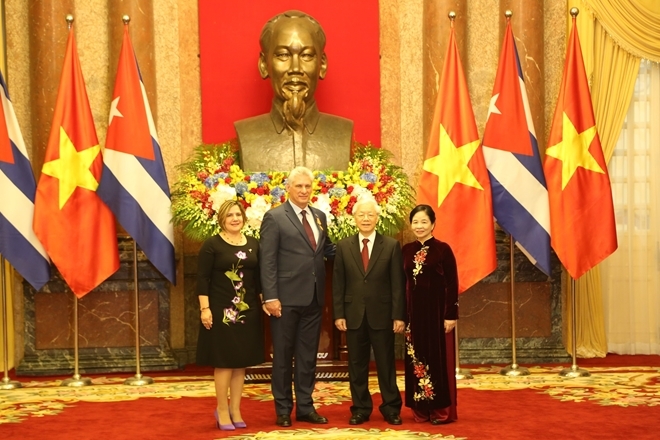 Party General Secretary, President Nguyen Phu Trong on November 9 hosted a solemn welcome ceremony for President of the Council of State and Council of Ministers of Cuba Miguel Mario Diaz Canel Bermudez at the Presidential Palace in Hanoi. On the morning of November 9, Party General Secretary, President Nguyen Phu Trong hosted a solemn welcome ceremony for President of the Council of State and Council of Ministers of Cuba Miguel Mario Diaz Canel Bermudez at the Presidential Palace in Hanoi. The visit is a step to continue bolstering the special relations between Vietnam and Cuba and realize agreements reached during the State visit to Cuba by General Secretary of the Communist Party of Vietnam Nguyen Phu Trong in March this year and the visit to Vietnam by Vice President of the Council of State of Cuba Salvador Valdes Mesa last September. Party General Secretary, President Nguyen Phu Trong and President of the Council of State and Council of Ministers of Cuba Miguel Mario Diaz Canel Bermudez inspected the guard of honor at the welcome ceremony. The visit also reiterates Vietnam’s consistent policy of unceasingly developing and cementing the friendship, fraternal solidarity, mutual trust, and comprehensive cooperation between the Parties, States, Governments and people of the two countries. It also affirms Vietnam’s support for the revolutionary cause of Cuba. 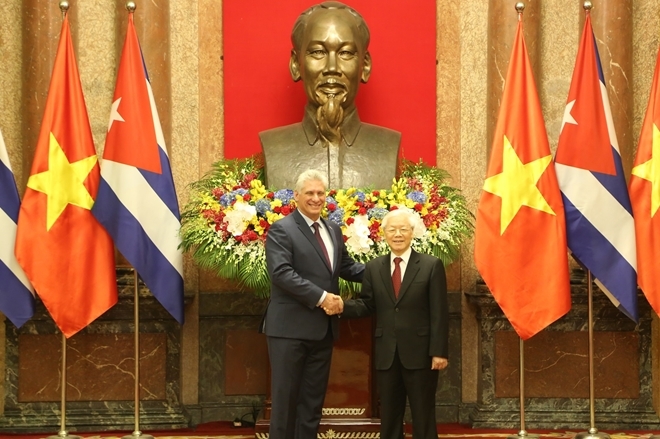 Party General Secretary, President Nguyen Phu Trong welcome President of the Council of State and Council of Ministers of Cuba Miguel Mario Diaz Canel Bermudez at the Presidental Palace. The solidarity and fraternal relationship between Vietnam and Cuba were fostered by Presidents Fidel Castro and Ho Chi Minh. The relationship has become a valuable asset and a source of great encouragement for the revolutionary cause of each country. The two leaders and their spouses at the Presidental Palace in Hanoi. After the welcome ceremony, Party General Secretary, President Nguyen Phu Trong and Cuban President will hold talks. The Cuban leader then will meet with Vietnam Prime Minister Nguyen Xuan Phuc and National Chairwoman Nguyen Thi Kim Ngan.